Art, like beauty, is in the eye of the beholder. Whether it’s created from office supplies or the first art carved into a cave wall in the Western Hemisphere, it is a very subjective medium. Like the public art display in New Orleans that asked passersby to tell us what they wanted to do before they died, artist Yayoi Kusama came up with the idea to utilize the vision of children. 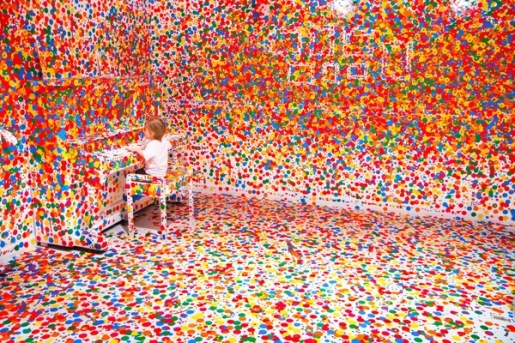 With the help of the wee little ones and thousands of colorful stickers, Kusama created an installation called The Obliteration Room at the Gallery of Modern Art in Brisbane, Australia. Kusama first painted a typical living space completely white – floors, tables, chairs, dishes, piano, everything. Then she provided thousands of colorful circular stickers (not unsafe stickers for children) to youngsters who visited the gallery with their parents and urged them to put the stickers anywhere they wanted. Over the month of December, the domestic interior transformed from a sterile white environment to the colorful crazy scene above. It looks like it might be a room from Willy Wonka and the Chocolate Factory. From floor to ceiling, the room was covered in dots. I guess the little folks had some help from their parents in the form of a lift to place a few colorful circles on the ceiling. This Is Colossal has pics from all stages of the room’s transformation.